The conference ICWES14 in Lille July 15-18, 2008 was under the theme of "A changing world: new opportunities for women engineers and scientists" and an opportunity for all participants to exchange ideas and information with outstanding professional and academic women working in an international and challenging environment, leading change and helping progress of cultural change. Mrs. Tinsel and Mrs. Kugele were giving oral presentations about the ESGI project. June 2008: EPWS First Annual Conference "Women Shaping Science"
The European Platform of Women Scientists EPWS held the first EPWS Annual Conference 2008 "Women Shaping Science" in Vilnius, Lithuania on 5 - 7 June 2008. The conference was organised in collaboration with BASNET, the Baltic States Network "Women in Science and High Technology". Mrs. Tinsel, Mrs. Kugele and Mr. Knobloch were giving oral presentations in the session "Women and innovation" and presented their project poster during the conference. This book provides a critical and historical perspective on the ways concepts of 'gender' and 'engineering' have been socially constructed and the relationship to the masculinist image of engineering that has endured over time. 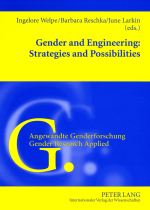 To alter this situation, the authors in this volume propose that the focus of analyses move from the under-representation of women in engineering to an investigation of the more relational concept of gender and how gender and gender relations are embedded in the entire engineering enterprise. This book is meant for anyone who recognizes the need to rebel against gender norms and binaries if engineering is to realize its potential as a more inclusive and socially transformative project. Contents: Critical perspectives on the social construction of gender and engineering - Historical analyses of engineering as a masculinist enterprise - The potential of engineering as a socially transformative project - Innovative approaches to transforming engineering cultures - Analyses of women engineers' identities - Gender impact on team work and the design context in engineering schools - Gender and research contents - Gender aspects of analyses of inventions. October 07: International Conference PROMETEA "Women in Engineering and Technological Research"